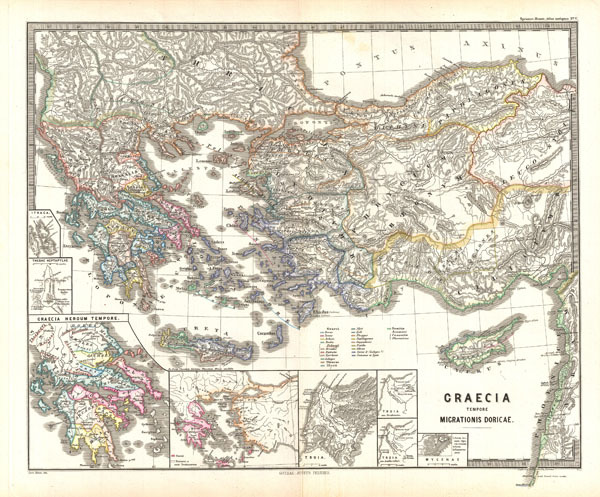 This is Karl von Spruner's 1865 map of Graecia Tempore Migrationis Doricae, or Greece at the time Doric Migration. Map covers modern day Macedonia, Bulgaria, Greece, Albania, Turkey, Cyprus, and Crete. The map also includes eight inserts, showing (counterclockwise) Ithaca, Thebae Heptapylae, Graecia Heroum Tempore, Danai, Troiani et socii Troianorum, Troia, Troia sec. Strabonem, Troia sec. Lechevalier, and Mycenae. Each map shows the migration of the ancient peoples, including a color-coded key for each tribe. Important cities, rivers and mountains are labeled. Countries and territories are designated with colored borders. The whole is rendered in finely engraved detail exhibiting throughout the fine craftsmanship of the Perthes firm. Rumsey 1626.005. Phillips (atlases) 3288. Espenhorst, J., Petermann's Planet, p. 397-404. Espenhorst, J., Andree, Stieler, Meyer & Co., p. 148.